Summer is here! Yeah! This is the time of the year when I can sit outside in the screened porch and read, do art work, water the plants and enjoy the birds singing. 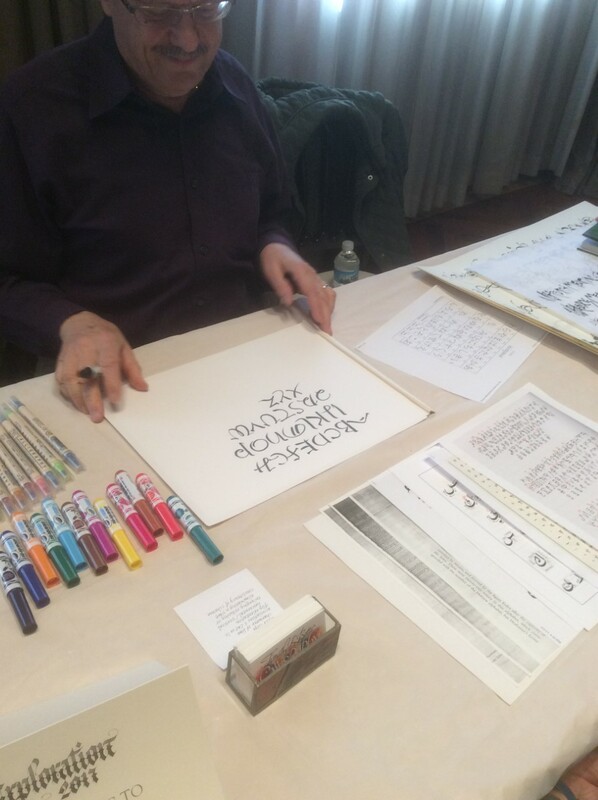 I don’t do any calligraphy out there, but can certainly read my lettering books and think about it!!! 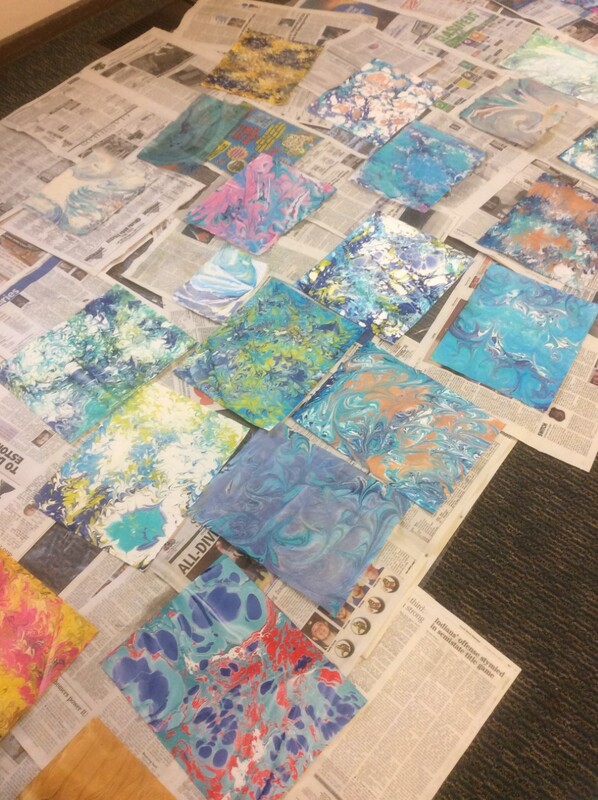 Our April 1 meeting was so much fun. 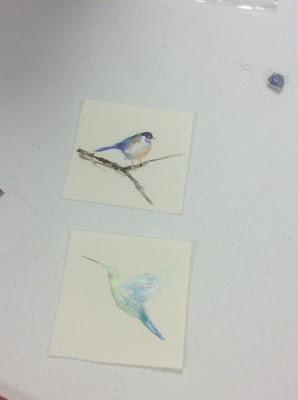 Barbara Walsh led us in some small bird water coloring. 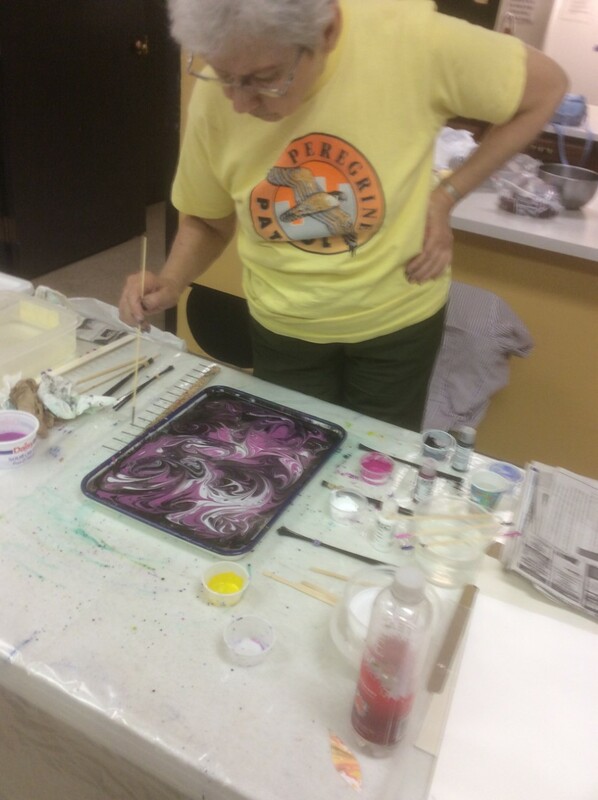 She has a very light touch with her small brushes and we learned a great deal just watching her. Thanks Barbara for lending your talent to our guild. That same afternoon, Sharon Esmont and I went to the Havilah Beardsley House in Elkhart to partner with them during an exhibit called “Can I Have Your Autograph”; Fakes and Forgeries. There were several historic signatures including presidents, British dignitaries along with Marilyn Monroe and Betty Grable. Sharon and I sat near the entrance and wrote out bookmarks for the incoming visitors. The kids are the most fun to do a bookmark for. They love seeing their name written differently and we were happy to talk to them and make them smile. On Sunday, May 7, Sharon Esmont, Pat and Angie West lettered bookmarks for the Beardsley House. 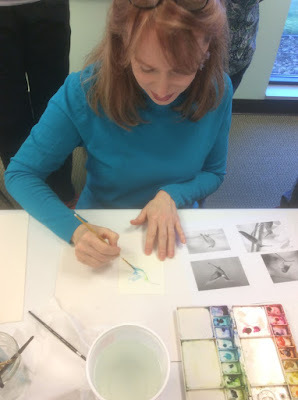 On Saturday morning, April 8, Renee Tuveson, Pat West, Laura Fuderer and I took the train into Chicago to attend the Chicago Calligraphy Collective Opening Reception. Linda Bravata, Tina Chronkite and Susan Burton met us on the train in South Bend and we had an enjoyable ride into Millennium Station. Once off the train, we took a taxi to the Newberry Library. Next we found a locker to hold our traveling items, like coats we didn’t need, while we perused the exhibit area and the demonstration tables. The calligraphy was beautiful although I feel that there is less than there has been in the past. 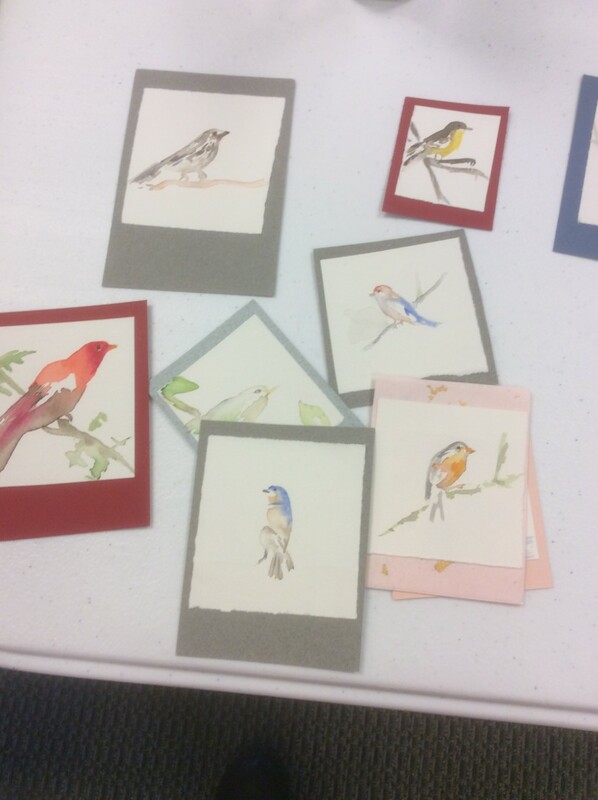 Demonstrations by Tim Botts and Lisa Kivland gave us inspiration of things we can do at home. Pam Paulsrud gave us a slide presentation regarding her exhibit of Treewhispers in the Middle East which was very informative and interesting. 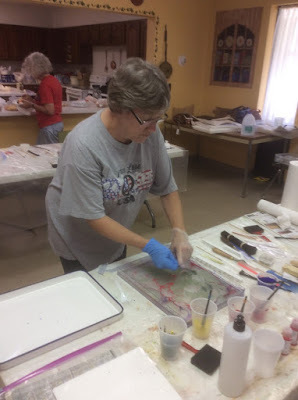 Pam has been collecting round handmade paper for years with most written on by many calligraphers, children and whomever wanted to participate. 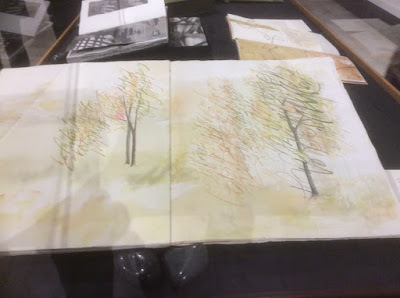 Go to Treewhispers.com if you would like to see what the exhibit is about. Pam is very passionate about Trees! Lastly, we were there for the Purchase Prize presentation and were very happy to see that our friend and instructor from Kalamazoo, Marijo Carney, was the winner this year. Her handmade book was only open to two pages, but those two pages gave us an insight to what the rest of her book is inside. Congratulations to Marijo! 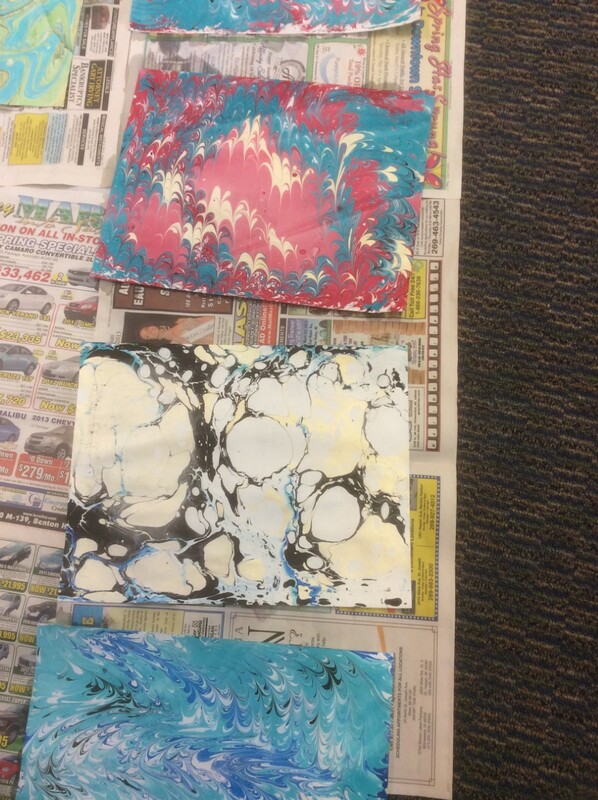 We enjoyed learning a fun and relaxing way to make ‘sculptured’ book art using old books. 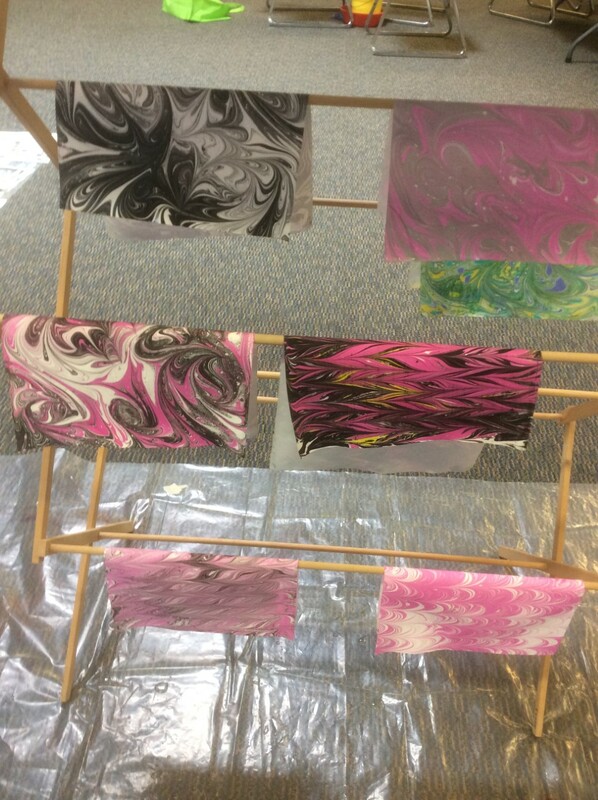 Monica Makielski, book folding artist, gave a demo today showing us how it is done. There are two ways to do this: fold or cut and fold. She had examples of both but showed us the simpler method, folding. We brought our own book; Monica gave us a pattern and showed us how to make a tulip. Using a bit of math to figure out where we start the pattern so it is centered, we insert the pattern behind the first page and make two tick marks at each end of the line in the pattern. We then fold the page 45˚ above and below the tick marks. 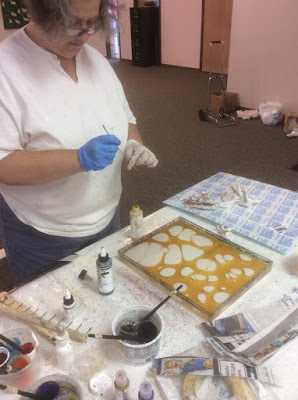 We continue doing this until the pattern is finished. 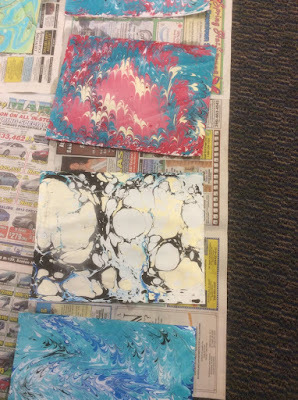 Of course we didn’t have time to complete the pattern; we took our book and pattern home to finish our ‘sculpted’ book. I am looking forward to our next meeting to see who finishes theirs and brings for show & tell. June 3 was our next meeting where Laurie Heyden gave two demonstrations two different types on book folding. The second one, an expandable folder, was a little more complex, but with Laurie’s help, we all came home with two new ways to make a book. 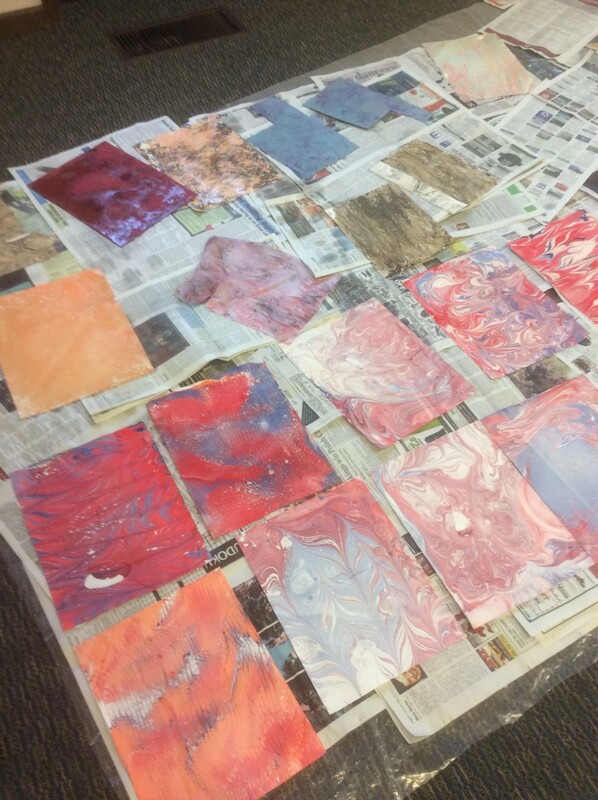 Eleven members got together on Saturday, June 10, to make marbled papers. 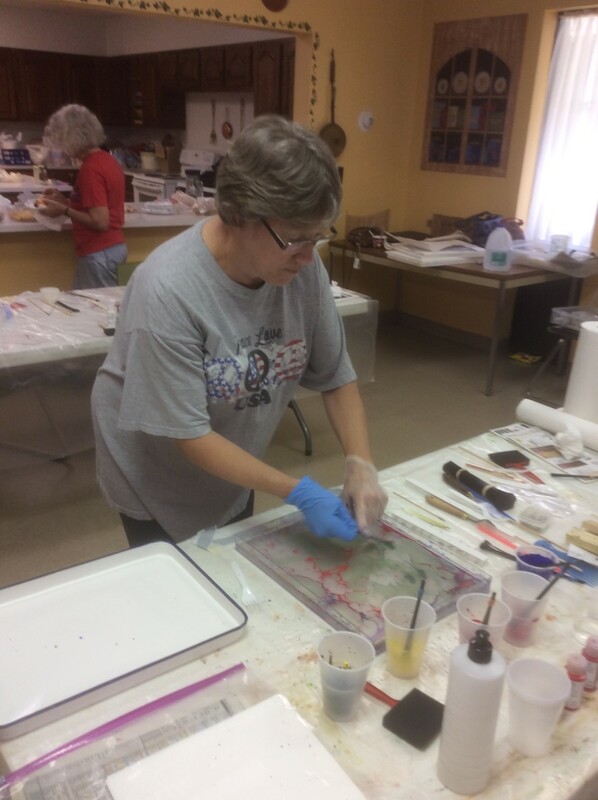 Angie West led the newbies through a couple of demonstrations and then everyone was on their own choosing colors and marbling papers. We had a fun day together and came home with beautiful papers. Now we have to decide what to do with our papers….books, broadsides, etc. The possibilities are endless! Thanks Angie for putting this all together including ordering all the paper and supplies needed. 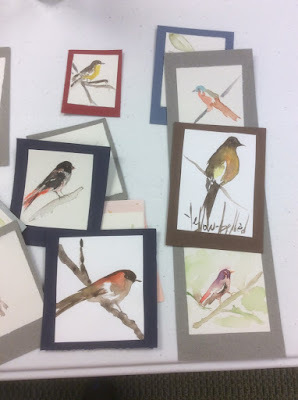 Since my daughters and their families come to visit during the month of July, I don’t get much art work done, so I get my exchange book for August done early and then I don’t have to stress about it when the kids have taken over my art room to draw, paint, cross stitch and sew. Hope you can all spend some time working on a handmade book for the August meeting and hopefully it will have some calligraphy in it. The August meeting is always a fun time, especially the picnic part with all the wonderful food, and, there is always a raffle involved. Mark your calendar for August 5, 2017. Meeting at 10 and lunch at noon. PS – Don’t forget that July means “Pay your MCG dues of $15. For the 2017-18 year. We have booked Jacqueline Sullivan for our next workshop in the fall of 2017, September 30 and October 1. 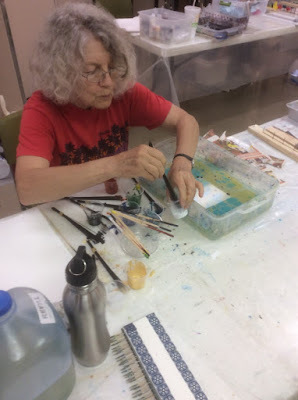 If you have seen the work that Renee, Anna, Pat and Ginny brought for show and tell from Lake Louise, it will give you an idea of what we will be doing in that workshop. There will be a maximum of 20 participants. The cost for this workshop will be $110. for members and $125. for non-members. Marty Mitchell has secured one of our favorite venues, Whispering Pines, for this workshop which will be held from 9 until 5 on both days. 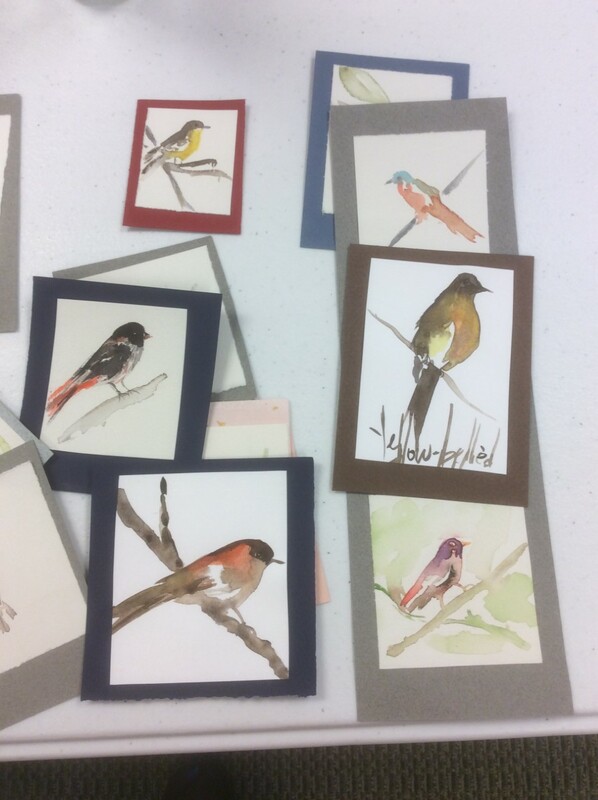 Laurie Heyden will be accepting cash or check for this workshop at the July meeting. Future Workshops - It seems that instructors are booking their workshops way, way out in the future and we have secured two really good calligraphers for our future workshops. 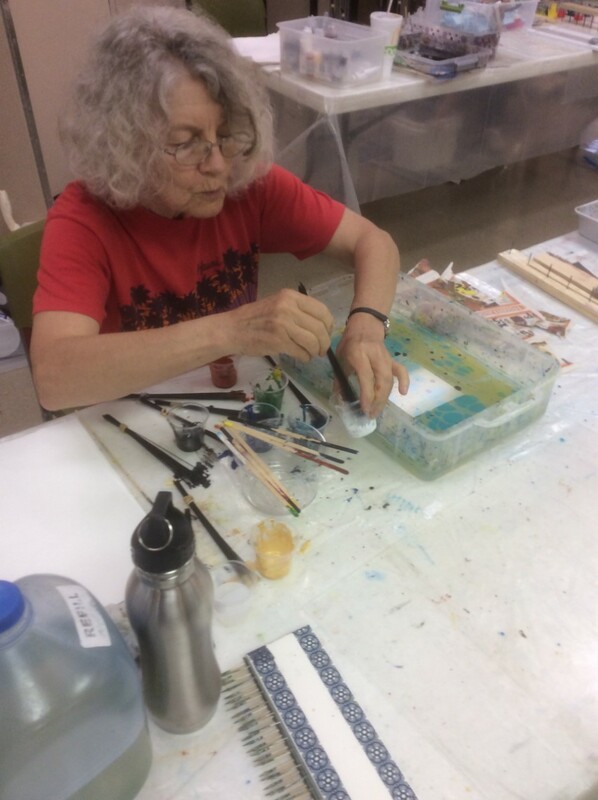 Please mark your calendars for May 22 and 23, 2018 (a Tuesday and Wednesday) when Yukimi Annand will be in South Bend for a workshop for the MCG and also Heather Victoria Held for the weekend of April 6, 2019. Both of these ladies are booked solid and these were their first available dates. Save the dates and save your pennies because these workshops will cost a bit more since we have to fly them here from Canada and California. Luckily for us, we will piggy back onto the Chicago Guild’s dates for Yukimi Annand so we won’t have to pay the whole airline fee. Another guild will be looking at Heather Held’s dates to see if they can piggy back onto ours and we can again share that cost. I have said many times that we try to keep our fees as low as possible, but when an instructor comes from a distance away, they charge us more for travel and baggage and we pass that on to you. You won’t want to miss either of these workshops! 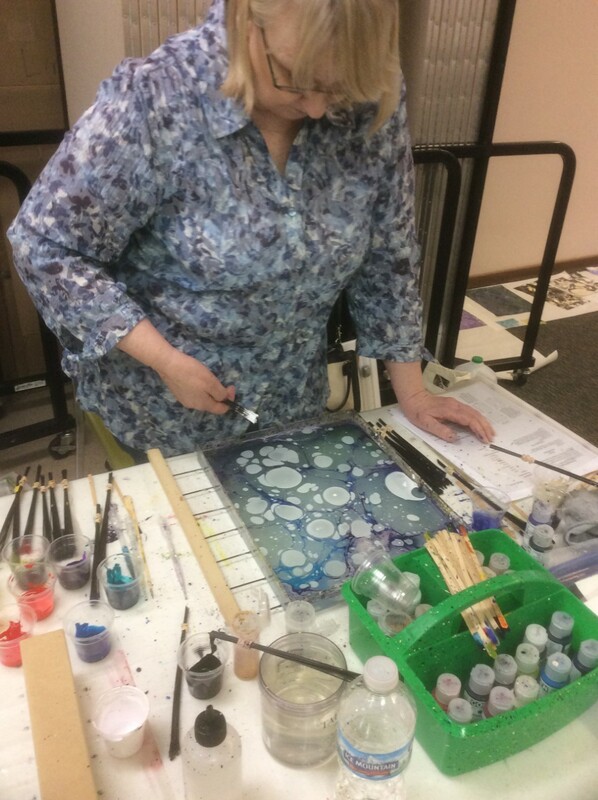 Jacqueline Sullivan – Jacqueline Sullivan, who will be coming to South Bend in late September, 2017, has a website that she posts art tips and upcoming workshops she will be conducting. If you are interested, send in a request to Jacqueline. 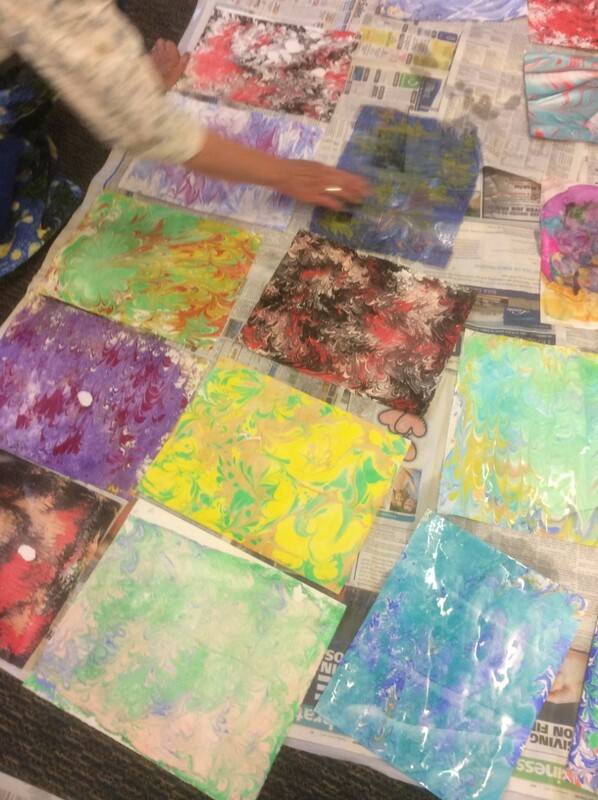 Go to http://blog.jacquelinesullivan.com/workshops/ and click on mailing list. PO Box in South Bend – Due to a lack of much mail at our Post Office box in South Bend, we have suspended any mail sent to that address. If you have anything to send to the MCG, please send to Laurie Heyden, 18292 Courtland Drive, South Bend, IN 46637 or Ginny VanderHey, 51854 Stoney Creek Drive, Elkhart, IN 46514. When monies are due for a workshop or dues, they will now go to one of these addresses. August – Annual Picnic at Ginny VanderHey’s house. Our exchange will be a handmade book of your choosing.